3. Separate the egg yolk from its whites and beat the egg whites until stiff peaks form, then set aside. 4. In a large bowl, beat the butter until light and fluffy. Add the mashed bananas, egg yolks, and vanilla, and mix until smooth. 5. Gently fold in 1/3 of the egg white mixture. 6. In a medium bowl, whisk together the flour, sugar, baking powder, baking soda, and salt. 7. Gently fold the dry ingredients into the wet ingredients until just combined. 8. Gently fold in remaining egg whites. 9. Fill muffin liners half full and bake 11-15 minutes, or until a toothpick inserted in the center comes out clean. 10. Remove and let cool completely. 11. To make the frosting, beat together the butter and cream cheese until light and fluffy. 12. Add the powdered sugar slowly and beat until light and fluffy. 13. Beat in the vanilla. 14. If necessary, add more powdered sugar until the frosting is firm enough to hold its shape but still light and fluffy. 15. 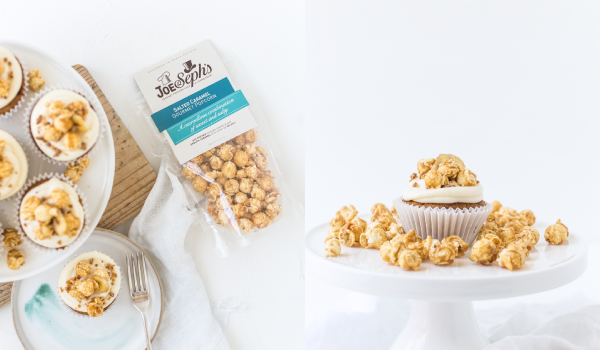 Frost the cooled cupcakes and top with Joe and Seph’s Salted Caramel Popcorn.